Our friends over at Photojojo have come up with a creative way to use all those film canisters that just end up in the garbage behind your local film-developing store. I know, these colorful canisters may look strange to some of you younger folks. Before the wonderful popularization of digital cameras, people had to deal with a little plastic canister of film for every 36 photos they took. Now we are lucky to be able to store thousands of photos on our computers without the hassle of organizing physical objects. 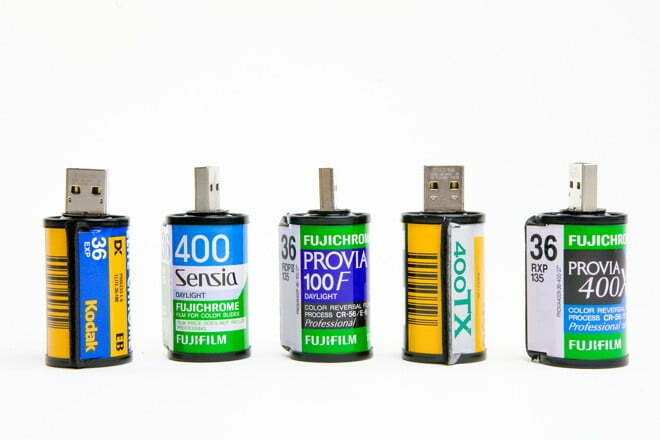 If you need external storage for your photos, why not get a bit cheeky and keep them on a USB Film Roll ($20) from Photojojo? The film roll USBs have 4GB of capacity, which translates into up to about 1,000 photos. Photographic film nerds will also appreciate the fun of the different films available. You can’t choose which one you get, but order a few and you’ll get some variety.